GEOINT 2016 was a fantastic geospatial data focused three days hosted by the United States Geospatial Intelligence Foundation (USGIF). With more than 260 exhibitors, the show paired the interests of government and commercial stakeholders, highlighting emerging geospatial technologies and solutions. Whether it was through analytics applications, geospatial visualization, or information services, the show was heavily focused on the utility of big data. ORBCOMM’s ability to augment other forms of surveillance data such as radar imagery with AIS is really what caught people’s eye. Through strong partnerships, being able to exhibit and analyze multiple streams of data is what provides the added value to our customers in identifying and monitoring vessels. Attendees were excited about the value to financial and safety applications that this data provides. Merging multiple forms of data to enhance geospatial intelligence highlighted well with the overall theme of Big Data applications. As a non-profit and non-lobbying educational organization, USGIF promotes the training and education of youth. 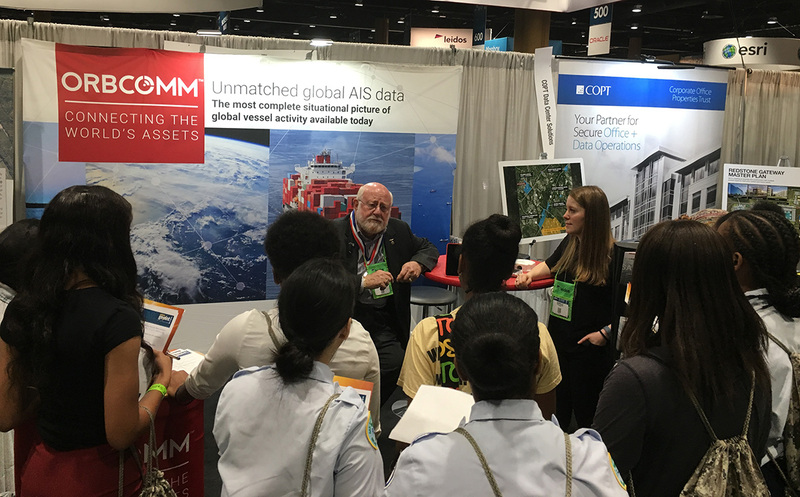 Throughout the show we met with some excited young professionals who were participating in USGIF’ Young Professionals Program, intended to expose young individuals entering the geospatial field to the market. Also, on the final morning of the show we were thrilled to welcome to our booth about 50 cadets from a local high school who were taking a tour of the floor and exploring the industry. They were excited to learn about ORBCOMM’s leading AIS technology and the benefits it has to our customers. We discussed the implications that AIS has had on the maritime market as the technology has evolved, particularly with the launch of ORBCOMM’s new 11 satellites. Guy Thomas, the creator of space-based Automated Identification Systems, emphasized the evolution of maritime tracking capabilities since 9/11 when serious vulnerabilities to terrorism were addressed. The students were very interested in what it takes to track vessel transmissions from satellite and the financial and security benefits. It was an honor joining my colleagues at the booth, chatting with partners, and engaging young minds. We can’t wait for GEOINT 2017 in San Antonio! For more information on the ORBCOMM Satellite AIS system, please contact us at 1-800-ORBCOMM;satelliteais@orbcomm.com or visit www.satelliteais.com.